This is my very first scarf. Isabelle has worn her poncho three times now, each for about 5 minutes. I think she does like it but it is just not cold enough here to wear it. It many never be cold enough in Sydney for a girl as super heated as Isabelle to wear it. We shall see. But while at Target the other day it became apparent that she would like a scarf. I wanted to go see the winter stock at Champion Textiles in Newtown so off we went. The yarn is Natal by Eki Riva, it’s 75% baby Alpaca, 18% silk and 7% polyamide. It is SOOOOOOO soft and snuggly. And absolutely foul to knit with, splity and fiddly. I have never knit with yarn of varying thickness before and I have to say I don’t like it, not this one anyway. 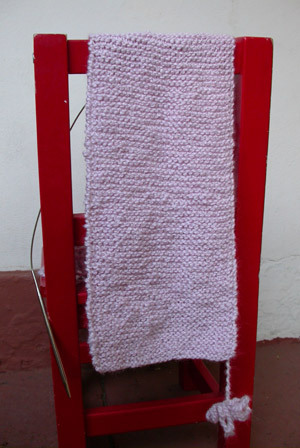 I am quite happy to make a scarf from it but would not want to have bought a sweater’s worth. What I am considering buying a lot of is Eki Riva Sport (it’s not sport weight btw, it knits up 14 stitches to 4 inches/10cms), it looks like it would be much nicer to knit with, is nearly as soft and snuggly and comes in the same lovely colours. It’s cheaper too. Thank you all for your thoughts about Isabelle’s hair, it has turned out to be a bit of a non event really. Despite cutting of handfuls of hair not a single person has noticed without it being pointed out to them. She was very lucky to have snipped out under layers. Or is that I am very lucky she cut the under layers of her hair? I probably care more than she does. Though she does miss her scissors. Proudly powered by WordPress Strayhorn | Entries (RSS) and Comments (RSS).